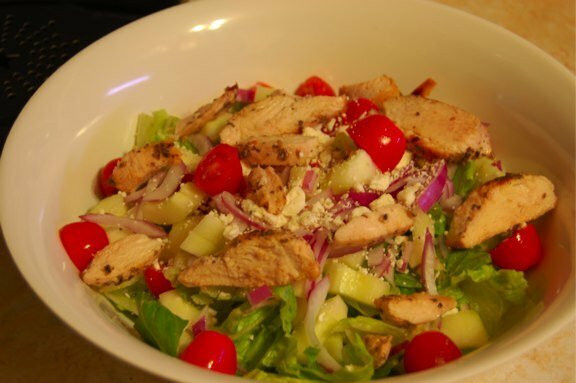 At home one night with plenty of nicely marinated chicken but no pita to be found, I had an epiphany - if souvlaki is basically an undressed Greek salad with chicken on a pita, why couldn’t I eat it as a DRESSED Greek salad with chicken without a pita? And thus my new summer standby meal was born - the chicken souvlaki salad. This recipe will feed two very well and leave four wanting more (I suggest getting some baklava for dessert). Mix the marinade. Reserve half to dress the salad, and combine the other half in a zipper bag with the chicken. Marinate the chicken for 4 to 24 hours. Grill (or saute) the marinated chicken breasts. Slice thinly. Prepare the salad vegetables. Top with the chicken and cheese, then the reserved vinaigrette. If you’re feeling really saucy, you can use tzaziki as a dressing instead of the reserved half of the vinaigrette. Or you could just use both.